A fellow autograph collector had an extra set of these Tampa Bay Devil Rays cards and gave me one. As I'm getting autographs and sorting through the set, a guy standing near me is talking to the players and they're all greeting him by his name, Hammer. 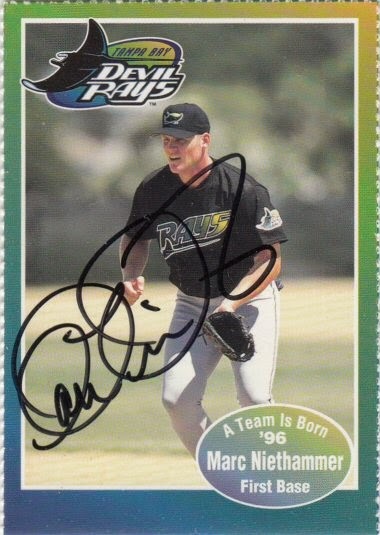 I noticed I had a card of Marc Niethammer, but also knew that he had been released by the Devil Rays a couple weeks prior. I then realized it was him, visiting his former teammates. Marc signed a 1996 Tampa Bay Devil Rays Team Set card.